Religious leaders prayed in the garden just before Trump signed the executive order. Two nuns from the Little Sisters of the Poor, the plaintiff in a federal lawsuit seeking relief from the Affordable Care Act’s contraception mandate, were among those on stage for the signing, according to a press pool report. Trump promised during the campaign to dismantle the Johnson Amendment, which bans tax-exempt organizations like churches from political speech and activities. His executive order relaxes IRS enforcement of that ban. While the executive order signals a promise kept, fully repealing the Johnson amendment would require Congressional action. The executive order, called "Promoting Free Speech and Religious Liberty," also gives "regulatory relief" to companies that object to an Obamacare mandate for contraception in health care. That builds on the 2014 Hobby Lobby Supreme Court case, which found that the Affordable Care Act mandate that certain corporations must provide female employees with no-cost access to contraception was a violation of the Religious Freedom Restoration Act. 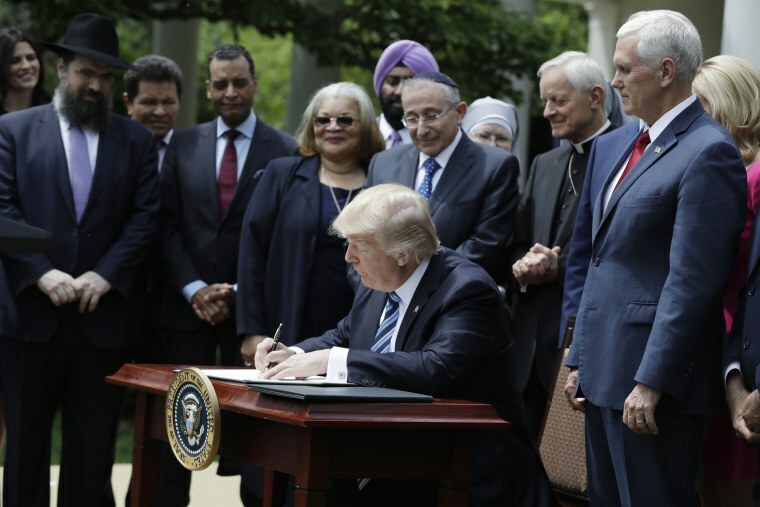 While an earlier draft of the religious liberty order reportedly would have let federal contractors discriminate against LGBT employees based on faith beliefs, Thursday’s version did not include such provisions. Conservative religious groups applauded the move. “The open season on Christians and other people of faith is coming to a close in America and we look forward to assisting the Trump administration in fully restoring America’s First Freedom,” Family Research Council President Tony Perkins said in a statement. Civil liberty groups criticized the order with several vowing to sue. "Plain and simple: President Trump’s executive order will hurt women," Nancy Northup, president and CEO of the Center for Reproductive Rights said in a statement. "And the Center for Reproductive Rights is ready to fight back in court."